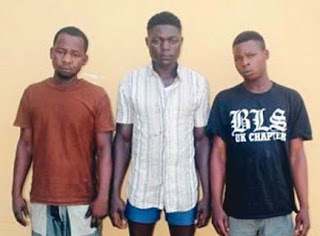 It was learnt that the guard, David Kwaguru, and two of his friends killed a 25-year-old final year Civil Engineering student of the Federal Polytechnic Nekede, Imo State, Mr. Innocent Ndukwe, at the deceased’s residence at 18 Enuwa Street, Egbu in the Owerri North Local Government Area of the state. According to the Commissioner of Police, Mr. Taiwo Lakanu, after killing the suspect, the security guard and two of his friends, Friday Ayuba and Francis Amos, made away with the deceased’s Nissan Pathfinder with number plate, KRD109AD, two plasma TV sets, one home theatre and other valuables. He said, “Since oga Ndukwe had the money (because of his wealthy parents) and expensive household electronics, we decided to kill him, put the devices inside his vehicle and drive to Plateau State where we come from. Lakanu appealed to members of the public to always be careful when choosing the people they employ as security guards, lamenting that most security guards, more often than not, turn against their employers by collaborating with criminals to attack them.